It nearly springs which means that it is almost Easter. That means that it’s time to start thinking about your DIY Easter decorations. To help you with that, I have a great list of 25 creative and easy to make DIY outdoor Easter decorations. These decorations will fill your yard with fun and beautiful Easter themed décor. Whether you like wooden signs on the front porch or you want to create your own Easter tree decorations, I have just the DIY projects for you to turn your outdoors into beautiful colors. Many of these projects can be made with upcycled or repurposed materials, and you know how much I love to repurpose. From reclaimed wood to the most adorable repurposed mason jar projects, all of these DIY outdoor Easter decorations are perfect for helping you to get ready for the holiday. There are even some fun projects that the kids will love. If DIY Easter decorating is your thing, this is definitely a list of projects that you want to see, and you should also take a look at these 20 fun family Easter traditions. You’ll want to start these this year to add fun to your holiday for years to come.One of my favorite things about spring is Easter and one of my favorite things about Easter is decorating. Whether you typically go all out and DIY a bunch of new Easter décor or you just want something to add that special touch to your outdoor decorating this year, these 25 DIY outdoor Easter decorations are going to fit the bill. And, they are all super easy to make. Because many of them use repurposed materials, they are also super cheap to DIY – much cheaper than buying them in stores. You should also check out these 25 homemade Easter basket ideas to save yourself some money and make those Easter baskets extra special this year. This adorable bunny crossing sign can be made from repurposed wood and it is really easy. How adorable would this be in your front yard this Easter? You only need a couple of boards to make it, so if you have something left over from other projects or you have recently torn down a barn or other building, you have all you need to make it. 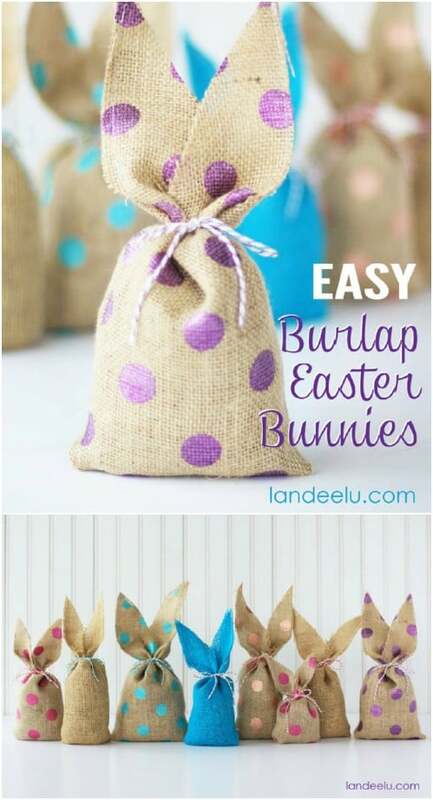 These little burlap Easter bunnies are so cute and they are super easy to make. These would look great decorating your front porch or deck. If you want larger ones, you just cut your burlap into larger triangles. It’s so easy to customize these and make them any size that you want. Plus, you could use them to decorate your front lawn Easter tree! This carrot door hanger is almost too adorable! You make this with foam board, green tulle and a few basic craft supplies and it is the perfect hanger for your front door this Easter. If you are tired of the traditional wreath and just want something a bit more unique, this is it. And, you can make this from start to finish in just one afternoon. Show the true meaning of the Easter holiday with this amazing DIY cross wreath. You make this with twigs, which means that it could be a completely free project. There are some wonderful ways that you can repurpose twigs and sticks in your décor, and this cross wreath is one of my favorites. Once you have the cross formed, you can add lovely flowers or anything else you want to personalize your wreath. I love a good mason jar project and this Easter themed version is one of my favorites. These are super easy to make and it gives you a great way to upcycle those empty mason jars. You could also do this with other glass jars – just whatever you have on hand. They are perfect for decorating your porch with fresh flowers or just sitting out on the patio table for a little added Easter charm. This easy to make DIY Easter egg garland is perfect for decorating your front door – or you could use it anywhere in the yard. It’s made from plastic Easter eggs, so there are no worries of weather affecting it. And, it’s a great project for the kids to give them something to do when the weather is bad. You can use up all of those plastic Easter eggs from last year! These little crepe paper covered plastic eggs are not only great for decoration, they are super fun for the kids to open. You create the egg poppers with plastic eggs, filling them with candy, money, or small toys. They serve as wonderful decorations for your front yard Easter tree and on Easter, the kids can pop them all and reap the rewards! These chalkboard eggs are so adorable and they let you create your own little Easter message. You can make these with real or plastic eggs. If you want something larger, the Dollar Tree and Dollar Stores have huge plastic eggs for just a couple of dollars per package. These are really great for decorating the front porch and you can make so many DIY Easter decorations with them. You have to love good DIY chalkboard paint projects! This repurposed wood Easter sign is gorgeous with its wreath that you make from a forsythia wreath that you can pick up at any craft or hobby store. You could also hang a DIY wreath that you can make from plastic eggs on this. You just paint Hope or any other wording that you want and then stand it up on the porch next to your front door. It’s cheap, easy and a gorgeous way to decorate your outdoors for Easter. 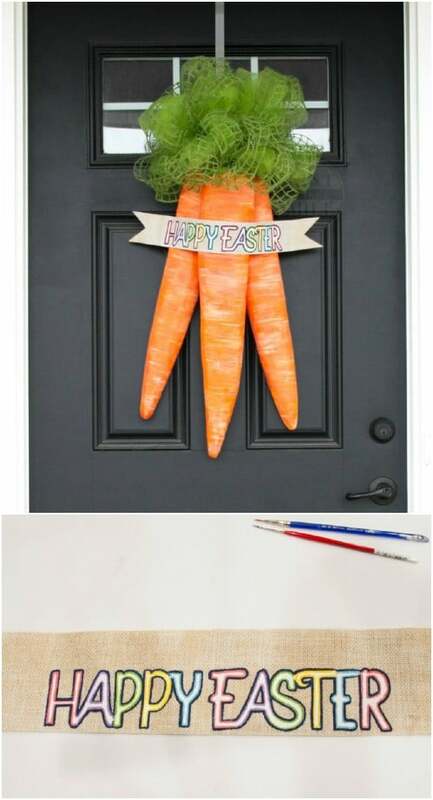 These mesh carrots are so easy to make and they are perfect for decorating your door this Easter. You can find colored mesh at Walmart and it’s pretty cheap. You don’t need much, depending of course on how many carrots you want to make. You could also do some of these to decorate your porch posts or mailbox, or just anywhere that you want to add some extra décor for the holiday. Moss covered eggs are perfect for your outdoor decorating. You can put them on a table on the porch or even out in your flower garden, or even use them to make your own DIY Easter wreath. However you use these, you are going to love how easy they are to make and how beautifully rustic they make your outdoor Easter décor. 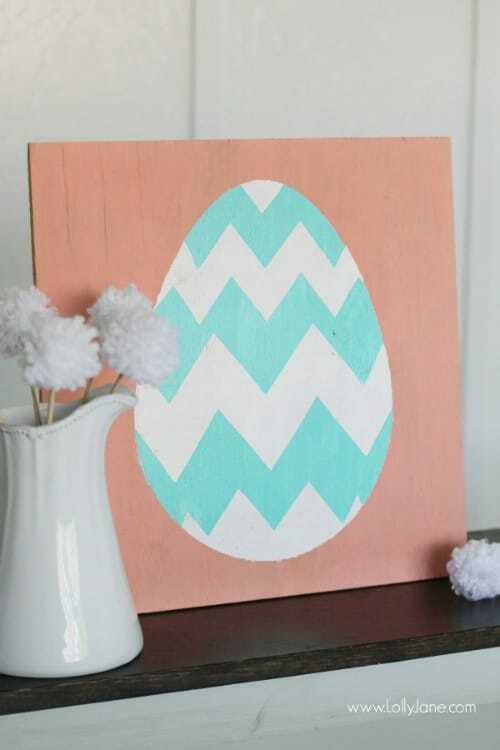 How adorable is this Easter garland that you can make from paint samples? You can get these paint chip samples at most hardware or home improvement stores. Walmart has them, as well. Once you have them in an array of pastel colors, you just cut them into egg shapes and string them up. I love the idea of having this garland on the front porch or even over your front door frame, and this is such a simple project. You can finish it in just an hour or so. These piñata eggs are perfect for your outdoor Easter decorating and for your Easter party. They’re pretty easy to put together and you can hang them all over your porch to give your home some DIY Easter décor. You can make them any size that you want for decorating and the kids are going to love them. Bunnies on a string are a wonderful way to dress up your outdoors this Easter. These are so easy to do and they are so colorful – depending of course on the colors that you use. You can string these up across the porch or just hang them on both sides of your front door. They’re simple and cheap to make and bring so much décor to your home. What a wonderful way to dress up your front door for Easter! 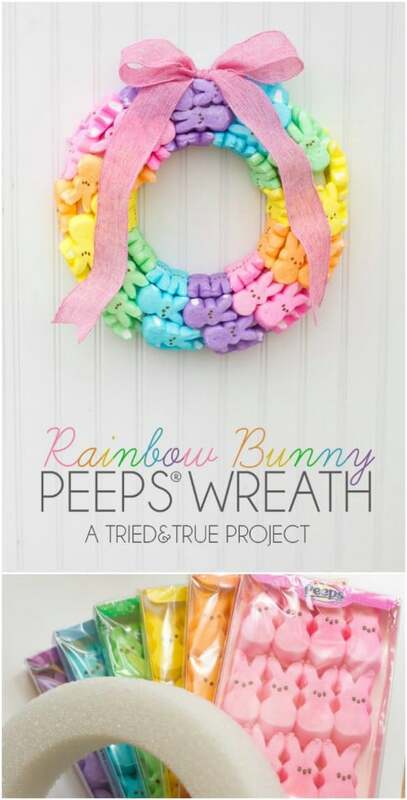 This rainbow Peeps wreath is so adorable and very easy to make. Peeps are inexpensive and they are perfect for helping you to add some DIY Easter décor to your outdoors. You just need a collection of Peeps in different colors and a Styrofoam wreath form to make this one. This is just one of many ways to enjoy marshmallow Peeps this Easter. These reclaimed wood Easter eggs are so rustic and gorgeous and they are super easy to make. What makes them so great is that you use wood from other projects or from anything that you have on hand. You just form and paint them to look like Easter eggs! If you are looking for a farmhouse type décor for Easter, these are perfect for adding to the outdoors. Salt dough ornaments are great. You can do so much with them. These Easter egg salt dough ornaments can be used to decorate your outdoor Easter tree or you could make a wreath out of them or just string them up garland style and hang them on the porch. This is such a simple project and one that the kids will love to help you to make. A few simple and cheap supplies from the Dollar Store are all you need to create this stunning Easter wreath for the front door. You can pick up all of the supplies for less than $10 and this is a really simple wreath to make. I love the robin eggs and you could embellish this in other ways if you wanted, like with a nice burlap bow. This wooden Easter egg sign would look great hanging by the front door or anywhere on your porch. I love how easy this one is to make and you can do it with repurposed wood so it won’t cost anything except your paint. If you have a few pieces of wood, let your little ones create their own Easter eggs and hang them all along the porch for some great homemade Easter décor. 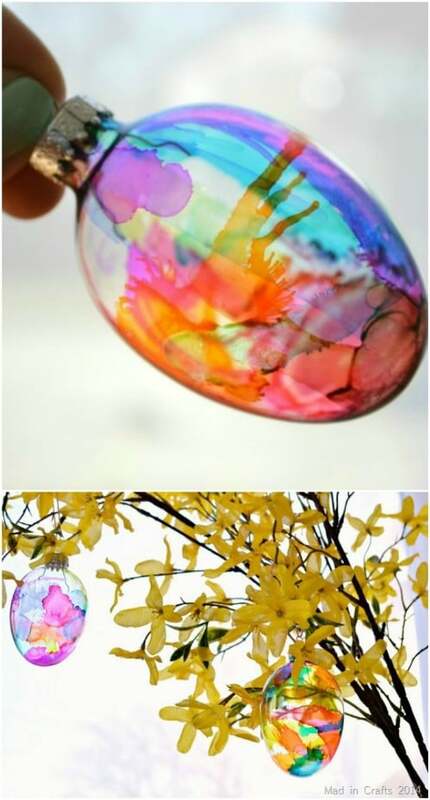 If you are decorating an Easter tree in the front yard, these DIY stained glass Easter eggs are perfect. You could also use them in a wreath or string them up for a great garland. They are really easy to make. You will need to find some clear glass ornaments in the right shape and you can get these at most craft and hobby stores. 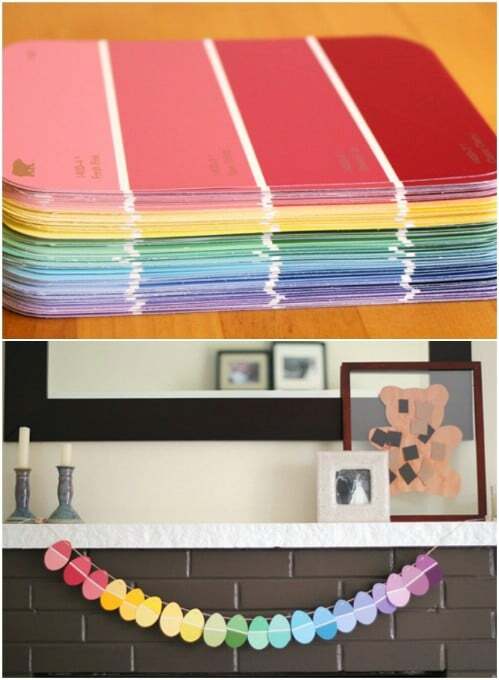 Then just add your favorite pastel paint colors. I do love a good DIY painted glass project. 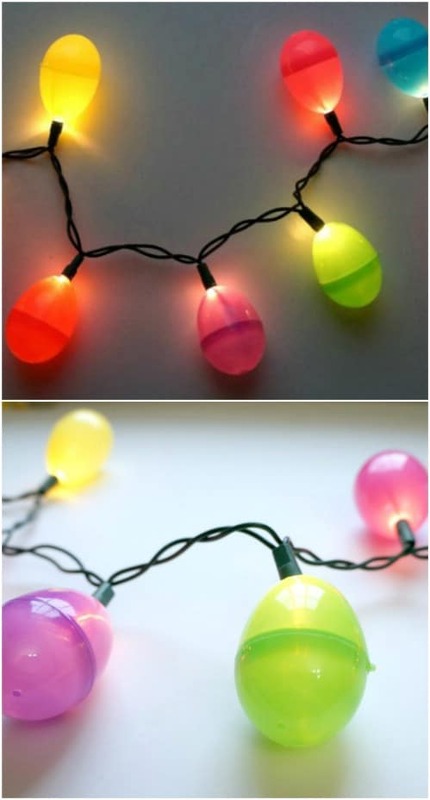 What better way to decorate your outdoors for Easter than with these cheap and easy DIY Easter egg string lights. You make these with plastic eggs – this is a great way to use up all of those eggs from last year – and clear string lights. They are perfect for lining your porch or deck or you could hang them in a tree and decorate your own Easter tree. I love this subway art sign that is perfect for Easter. You could do any message or picture that you want on this, although I love the hippity hoppity message. You can use an old board that you have left over from another project or reclaim a board from something that you are redoing. This is so simple and a great way to add some wonderful décor to the front porch. This topiary tree is great. It is really easy to do and your kids will love helping you to decorate the little tree for Easter. You make the tree yourself from a Styrofoam cone and some moss. Then you decorate with plastic Easter eggs or you could add anything that you have on hand for Easter tree decorating. This is a quick and inexpensive way to add some Easter décor to the front porch. 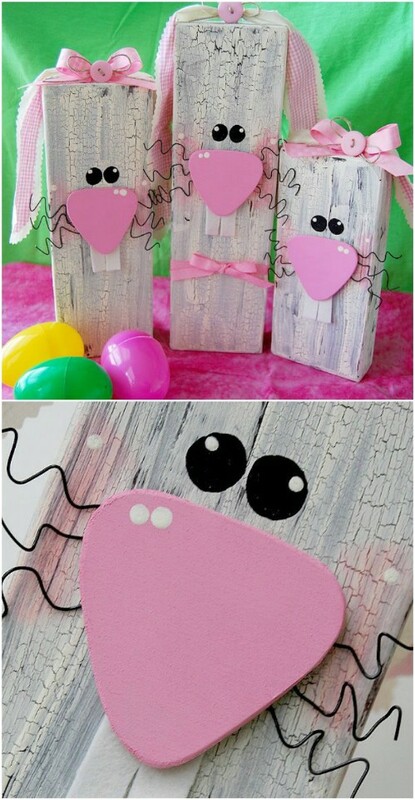 A few 2X4s or other boards that you have on hand will be great for making these adorable little wooden Easter bunnies. You can make an entire family to decorate the porch or stand these up by your mailbox or even in your flower bed. They are easy to make and have a great rustic look to them that is perfect if you are looking to decorate farmhouse style for Easter. I really love this Easter egg wreath that you make from embroidery floss. You create the eggs, in any number of colors and sizes, and then put them all together into an amazing wreath for the front door. This is really a unique craft and it is so much fun to make. You could do additional eggs and even create a matching garland for the porch or make little eggs for decorating your Easter tree. This is just one of many amazing DIY Easter wreaths that you can make for your front door this year.